NZD is acting stronger than USD due to the Chinese manufacturing PMI data. The support rests in 0.68820 with resistance at 0.69420 which the weekly pivot point at 0.69240 is located in between the lines. The EMA of 10 is moving with bearish bias and it is located below the EMA of 100 and the EMA of 200. The RSI is moving on 50 level, the MACD indicator is in neutral territory and the Stochastic is moving horizontally in neutral ranges. The ADX is not showing any clear signals. The price has already started its bullish trend after crossing the 61.8 level of Fibonacci. 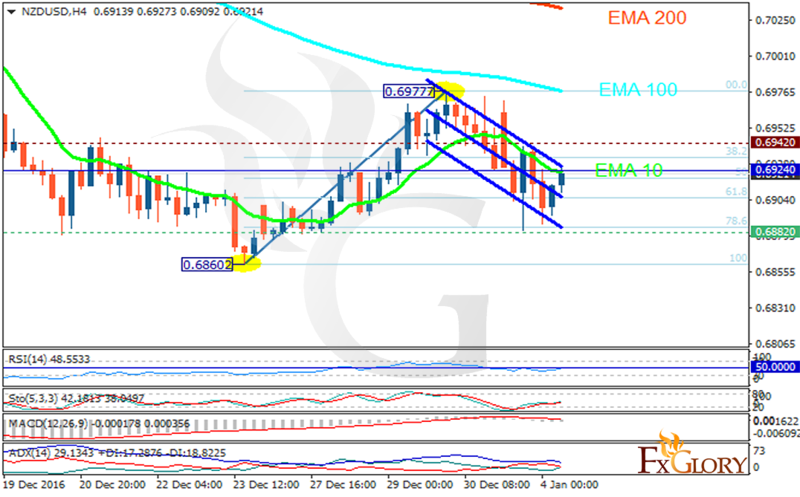 After its growth towards the weekly pivot point, the pair will be falling down targeting 0.6850.